Check out Part 1 of our Art Basel Miami Beach 2016 Mega Guide HERE. 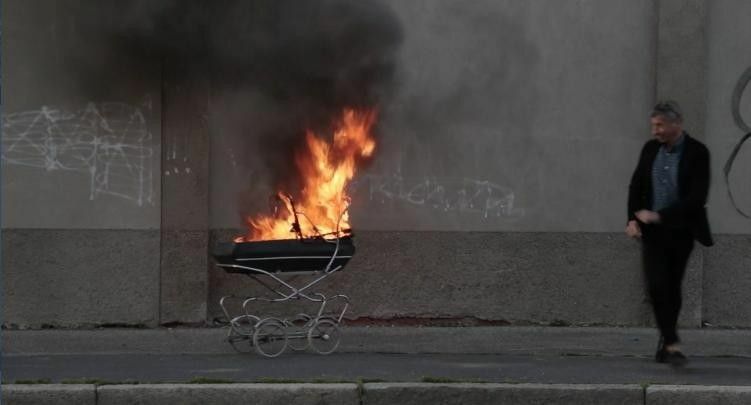 Screenshot, "Maurizio Cattelan: Be Right Back"
Art Basel's 2016 film program in Miami Beach includes the first film by Chilean-born artist Alfredo Jaar, a silent film about music by Christian Marclay and a special screening of Maura Axelrod's "Maurizio Cattelan: Be Right Back." Over 50 films and video works have been selected for screening outdoors and inside the convention center, as well as at the Colony Theatre on Lincoln Road. For his sixth year as curator, David Gryn has also chosen 28 short films by international artists that engage with music for a 2-hour program called "Best Dressed Chicken in Town," named after THIS reggae tune, with screenings at 8 p.m., Wednesday thru Sunday in SoundScape Park adjacent to the New World Center (500 17th Street, South Beach). MANA Common (2217 NW 5th Avenue, Miami) and Milk are hosting an invite-only, "live" event featuring Bill Viola's video/sound installation "Inverted Birth" (2014) on Tuesday, November 29, 6:30 to 8 p.m. On the night, the video will be accompanied by the PhilarMIA Orchestra with lead violinist Julian Rachlin, conductor Pablo Mielgo and dancer Jesus Pastor. 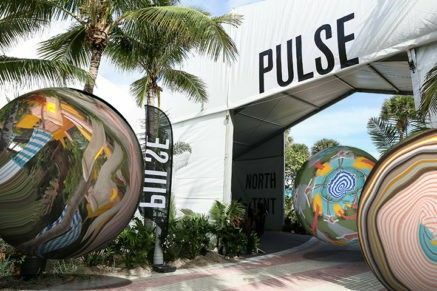 PULSE Miami Beach is back in Indian Beach Park (4601 Collins Avenue, Miami Beach) for the 12th edition of their popular fair, featuring over 75 local and international galleries. Their VIP, "invite only" preview brunch is Thursday, December 1, 10 a.m. to 1 p.m.; and then it's open to the public daily through December 4. They also have a "Young Collectors" cocktail party on December 1, from 5 to 7 p.m. Check out the site-specific installation, "Miami Marbles," at the fair's entrance by digital artist Anne Spalter. The artist used photos and videos of the city to create abstract images on large spheres. PULSE also partnered with Artsy so that you can go online to browse exhibitor booths and make inquiries starting on November 22. Their spin-off sector, PLAY, is a platform for the discovery of digital and new media works curated by Jasmine Wahl and Rebecca Jampol who have chosen works for viewing by 10 artists. The PRIZM art fair is moving to 7230 NW Miami Court in the Little Haiti/Little River neighborhood for this year's fourth edition. The submission-based fair specializes in solo presentations by African artists and explores the "global impact of Africa's cultural DNA." There's a special section dedicated to Pierre-Christophe-Gam's multi-media installation "The Chop Bar: The Love Feast." The VIP preview is November 29, 7 to 11 p.m., and then it's open to the public ($15) thru December 11. For the first time, a major Miami museum will present an exhibition by a living fashion designer during AB/MB. The Patricia & Phillip Frost Art Museum FIU (10975 SW 17 Street, Miami) has a big solo show by Cuban-American fashion designer Narciso Rodriguez, featuring over 40 couture designs, archival materials, sketches etc. along with major works of art selected by the designer. 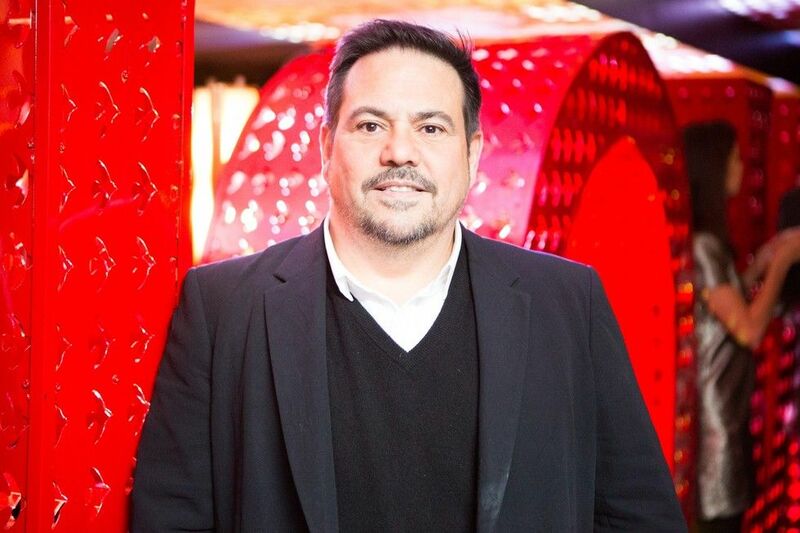 The exhibit was curated by Elle magazine's Alex Gonzalez and the museum's curator Klaudio Rodriguez. Admission is free and it's on view until January 8, 2017. Ugo Rondinone. Miami Mountain, 2016. Courtesy of the artist and The Bass and Art Basel. 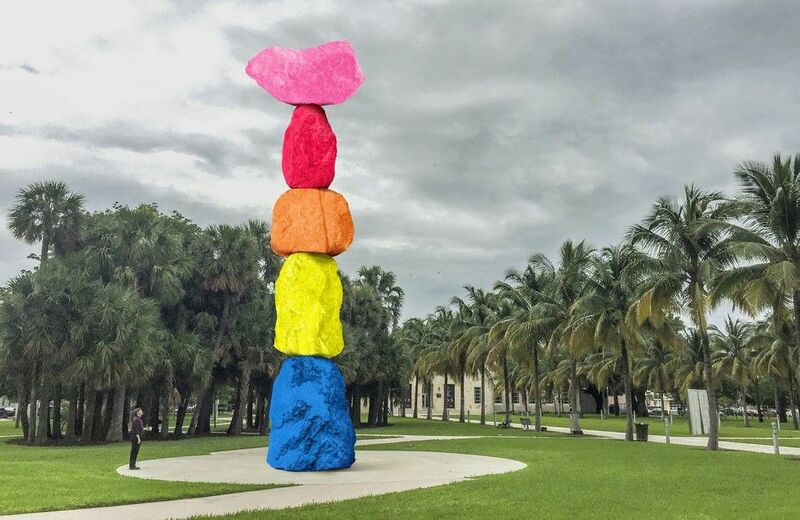 Unfortunately, the Bass Museum's ongoing $12 million renovation won't be completed in time for AB/MB, but they have been busy acquiring new works including Ugo Rondinone's "Miami Mountain" which should be installed in Collins Park in time for this year's fair. The museum will still be presenting works in Collins Park as part of the PUBLIC sector of AB/MB. 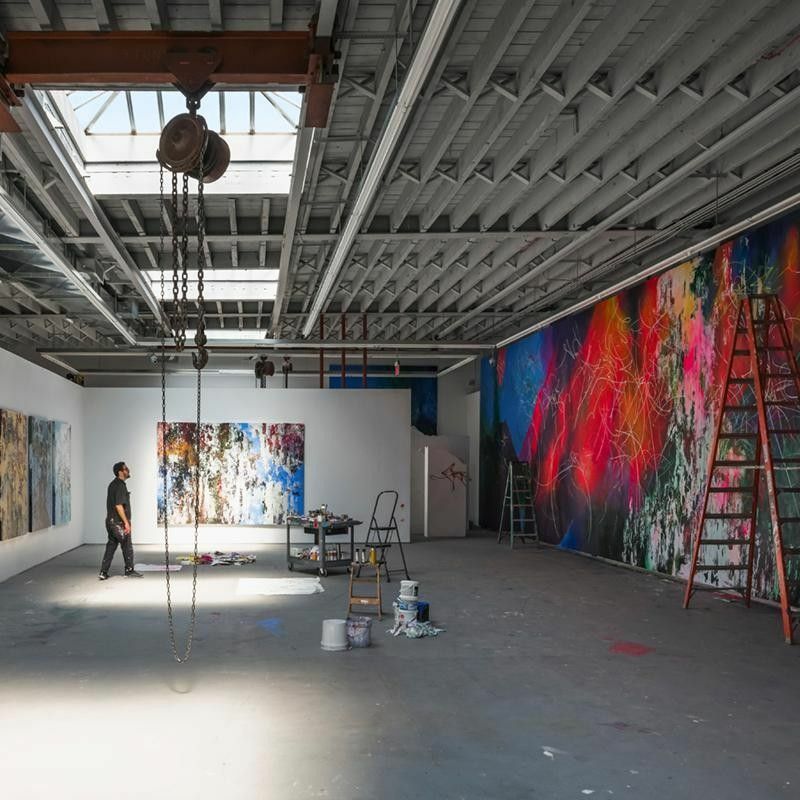 The National YoungArts Foundation (2100 Biscayne Blvd., Miami) has a solo exhibition of new paintings and sculpture by José Parlá called "Roots. It was curated by Laurie Ann Farrell (SCAD) and commissioned by Rolls-Royce Motor Cars. The opening reception is Tuesday, November 29, and then it's up thru December 15. Taro Izumi, Fish-Bone-Hanger, 2010. Courtesy artist, gallery, and Art Basel. In the AB/MB NOVA sector, young galleries get to show new work by up to three artists. 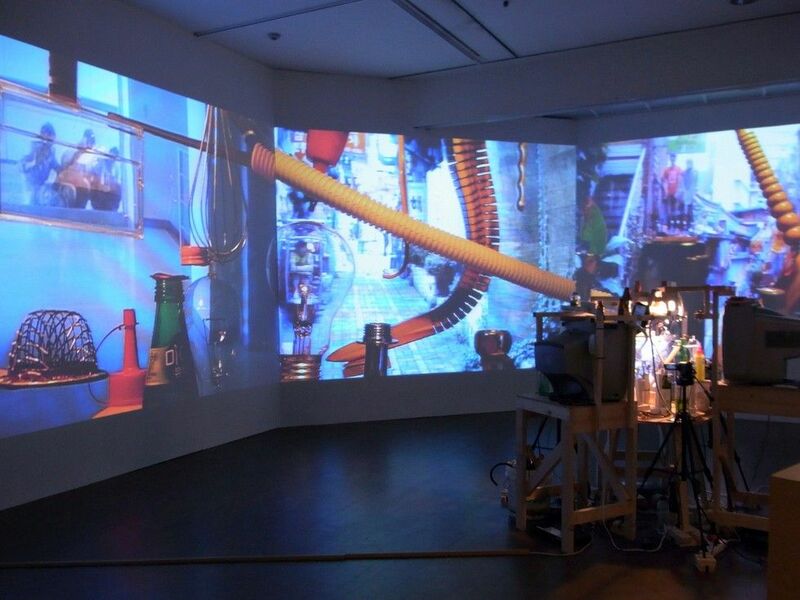 This year, look for a "disquieting" installation by Anicka Yi that explores "anxieties resulting from biotech" at 47 Canal; a 360-degree projected video environment by Taro Izumi at Take Ninagawa gallery; and "freshly cut hedges" by Chosil Kil at One and J Gallery. ArtCenter South Florida (924 Lincoln Road, South Beach) has a major lineup of exhibitions and events planned for art week. The centerpiece, "An Image," is designed to introduce their new "public programming model" featuring works by Enrique Castro-Cid, Harun Farocki, Alan Gutierrez, (Human) Learning, Barbara Kasten and Suzan Pitt, with an original soundtrack by Heinrich Mueller-Dataphysix Renormalon. Using film screenings, photos, paintings, artist talks, performances, study groups etc., the exhibition hopes to "evoke the feeling of being a part of the production of an image." Check it all out HERE. There's also an artist talk at 924 Lincoln Road with London's Otolith Group on Saturday, December 3, 2 p.m.; and two concurrent Open Studio Brunches on Friday, December 2, 9 a.m. until noon. One will be held at ArtCenter's Downtown Miami location at 1035 North Miami Avenue, #300, Miami, and the other at 924 Lincoln Rd., South Beach. Four (so far) promoters are hosting events during AB/MB this year. Resident Advisor has a big warehouse party on Wednesday, November 30, 10 p.m. to 5 a.m., and they're collab'ing with several local promoters to present Floating Points, Dam-Funk and The Black Madonna in the Factory at Magic City Studios (6301 NE 4th Avenue, Miami). Tickets are available HERE. 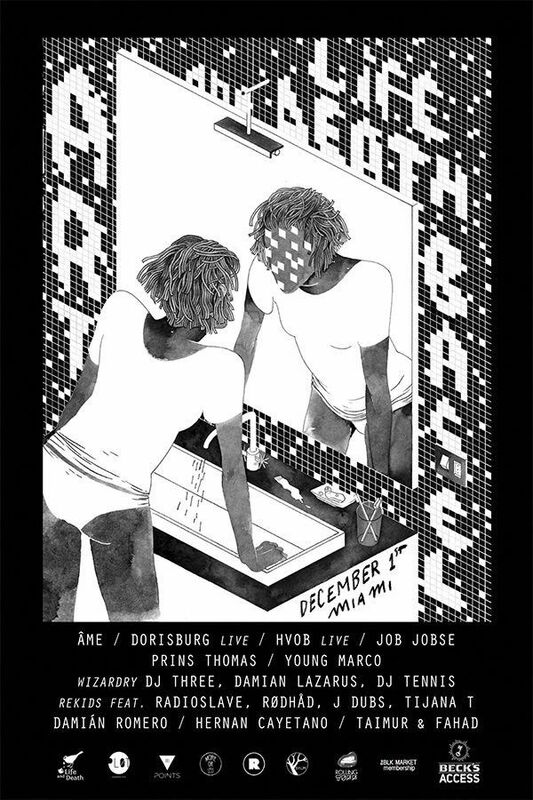 Also, in the same space on Saturday, December 3, Berlin-based DJ duo Tale of Us will bring their AFTERLIFE concept party to North America for the first time with a line-up including Marcel Dettmann, Mind Against, Recondite and Thugfucker. Sign up for tickets HERE. The Life & Death party returns for a fifth year with Ame, Young Marco, Prins Thomas, HVOB and many more in a new space at Little River Studios (300 NE 71st Street, Miami) on Thursday, December 1, 7 p.m. to 7 a.m. Also on December 1, the folks behind III Points present Young Thug, Shlohmo, Nick Leon and indigochildrick at Magic City. The entire schedule of III Points events during AB/MB is HERE. The Sagamore Hotel (1671 Collins Avenue, South Beach) -- Miami's original "Art Hotel" -- has a big group show called "Femme Fatale" featuring women artists and curated by Catherine Ormen, Ronit Neuman and Sebastien Laboureau. During the week, the hotel will also host a 150-year retrospective of French lingerie that was organized by the French Association for the Promotion of Corsetry Industries. "Lingerie Francaise" was curated by Catherine Ormen and includes over 100 pieces from the collections of 11 renowned French manufacturers. It is FREE and open to the public from November 28 to December 6. The annual Sagamore Saturday Brunch on December 3, 9 a.m. to 1 p.m., is invite only and includes music, art installations and dance performances, with pianist Ji playing at 10 a.m. and noon. If you're looking for some alternative diversion during the week, you can head over to the Adrienne Arsht Center for the Performing Arts (1300 Biscayne Blvd., Miami) and catch Courtney Love and Todd Almond in "Kansas City Choir Boy," -- "a theatricalized concept album about love altered by unexpected fate" -- that runs from November 30 thru December 11. Tickets are HERE. Splash photo: Alfredo Jaar, "Muxima," 2005. Courtesy Art Basel.